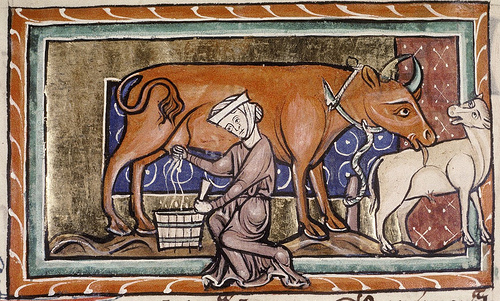 This post is inspired by an article I am writing and it is the first in a of a series of posts highlighting some of the many colourful legends about animals, in particular cows, associated with the early Irish saints. St Ciarán’s cow features prominently in folklore and hagiography associate with the saint. The cow was originally part of a herd of animals owned by the saints family. As a youngster the saint worked herding his families cows but as he became older he was drawn to the church and decided study and train under St Finnian at Clonard. The story goes as St Ciarán was leaving home he asked for permission to take one of the family’s cows with him. His mother refused his request. As he left he blessed one of the cows who then followed him with her calf to the monastery at Clonard. The cow was a dun (a greyish brown) colour and was referred to as St Ciarán’s Dun cow. This was no ordinary cow , she was an excellent milker and had the ability to supply the entire monastery with milk (Ó h’Ogain 1991, 88). in a soller and in dining-hall. She remained a companion of the saint for the rest of her life and when she died, her hide was kept as a relic at Clonmacnoise. The cow was also commemorated by the name of manuscript written at Clonmacnoise called the Leabhar na hUidhre or the Book of the Dun Cow (Ó’Riain 2011, 170). This book was compiled around 1100 at Clonmacnoise and it is the earliest surviving manuscript with literature written in Irish, and it contains the oldest version of the Táin Bó Cuailgne, the Voyage of Bran, the Feast of Bricriú, and other religious, mythical and historical material. 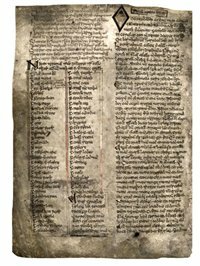 By the thirteenth century the manuscript was in the possession of the O’Donnells of Donegal. In 1359, when a number of the family were taken prisoner by Cathal Óg O’Connor, of the O’Connor family in Sligo, they were ransomed with Lebor na hUidre and Leabhar Gearr (now lost). Lebor na hUidre was recovered by Aedh Ruadh O’Donnell in 1470, and was in Donegal when the Annals of the Four Masters was completed in 1631. It then disappeared but was used by George Petrie in 1837 and turned up in the Hodges Smith Collection of 227 manuscripts which was purchased by the Academy for 1,200 guineas in 1844 (https://www.ria.ie/library/special-collections/manuscripts/leabhar-na-huidre.aspx). The cow also features prominently in the local folklore associates with Clonmacnoise. One early twentieth century folk tale from the area tells of a group of thieves from Coosan near Athlone stealing the dun cow from the field she was grazing in at Clonmacnoise. Afraid of being caught they beat her with a stick to make her run and to escape quickly but in their hurry the cow fell on a flag and her two knees sunk into it leaving in it the impression of two circular shaped holes. The cow got up again and the thieve drove her on to Coosan. When St Ciarán arose in the morning he found his cow was missing but by divine inspiration he knew what happened. He followed her tracks to Coosan. The saint then entered a boiling house and there to his grief he saw the skin of his cow hanging behind the door. Her horns were left on the floor and he body boiling in a boiler. The saint flew into a rage taking the skin from the behind the door and lifting the horns from the floor he moved towards the boiler. He placed the skin around the half cooked body of his beloved cow and immediately she jumped from the boiler alive and as active as she every had been before. Ciarán then returned to Clonmacnoise with his newly resurrected cow. The theme of the theft of the saints cows is common in Irish folklore and associated with many Irish saints. I plan to return to and explore this topic in a later post. 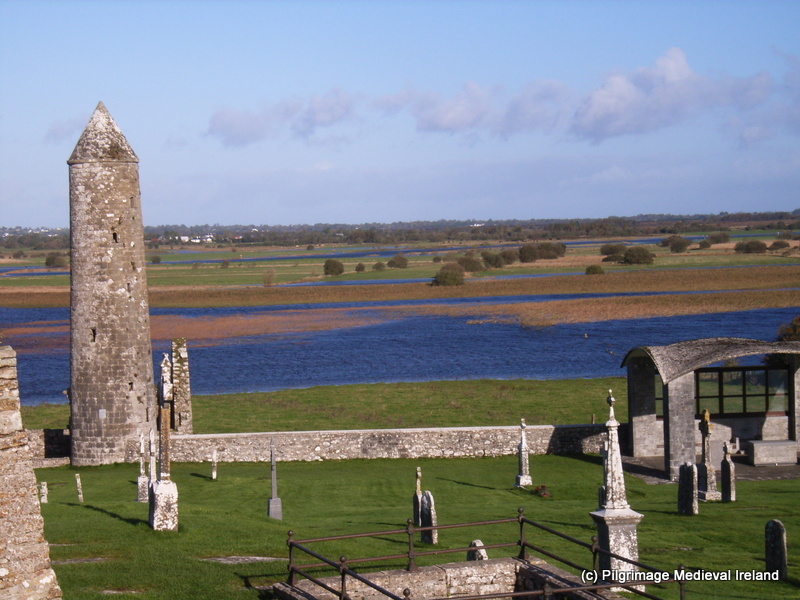 The legend of the dun cow has also left a physical imprint on the landscape of Clonmacnoise. A large bullaun stone located on the side of the Saint’s road that runs from Clonmacnoise past the Nun’s Church is associated with the cow. The bullaun stone where the dun cow fell and broke her hip. 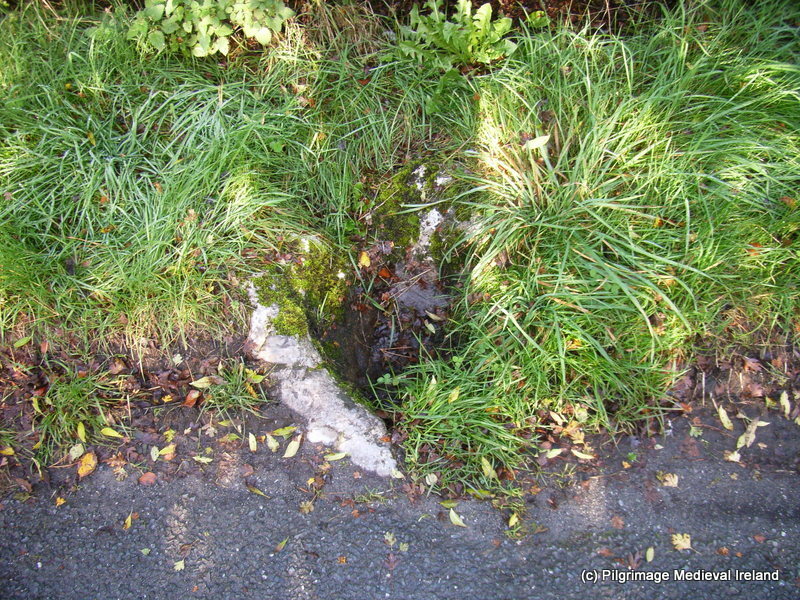 According to local tradition the stone marks the spot where St Ciarán’s cow fell braking her hip. The stone with its hollow is held to be the spot where the cow fell with the hollow created by the cow. During the nineteenth century this stone was used as a healing relic by pilgrims who would place their head in the cavities in the hope of healing. The stone was also part of the nineteenth century pilgrim stations. Lucas, A. T. 1986. ‘The Social Role of Relics and Reliquaries in Ancient Ireland’, .JRSAI Vol. 116, 5-37. New York: Prentice Hall Press. Doughcloyne, Cork : Collins Press. O’Riain, P. 2011. The dictionary of Early Irish Saints. Dublin : Four Courts Press. This entry was posted in Uncategorized and tagged Leabhar na hUidhre, Odhar Chiaráin, St Ciarans dun cow. Great story! I think St Manchan had one of those everlasting milkers as well, although I might be mis-remembering. Reblogged this on Up Against the Flooring.